Mayor Alfred Del Vecchio, who served as Mayor of White Plains for 18 years from 1976 through 1993, died overnight Tuesday. He was 95 years of age. The McMahon, Lyon and Hartnett funeral home has announced there will be a Visitation Sunday, December 9 from 3 PM to 8 PM at the McMahon funeral home,491 Mamaroneck Avenue, White Plains. Mass will be held for the Mayor Monday, December 10 at 10 A.M. at Our Lady of Sorrows, 920 Mamaroneck Avenue, White Plains. Mayor Del Vecchio brought White Plains into prominence during his years of service. 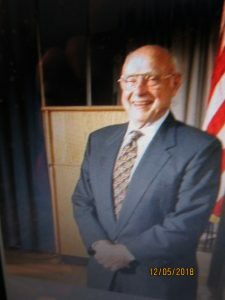 He shaped the rebuilding of the White Plains urban renewal project which introduced The Galleria in 1980, and numerous office buildings that made White Plains a corporate center. He preserved the outer neighborhoods and created the “city in the middle of the neighborhood.” He was a strong leader negotiating development with an eye to improvements for the city in addition to success for developers. He was a leader in every sense of the word. An engineer by profession, and a professor, he lead through expertise and intense involvement in negotiations, problem-solving, and his gregarious, but no nonsense personna. He stood up for the city against outside political influences that only had their best interests, not the city in mind. He created the esprit de corp that made the Department of Public Works, Planning and management of the city, professional, dedicated and performance-oriented. His financial management made White Plains taxes the lowest and most attractive to homeowners for decades–a legacy White Plains still enjoys. He left office in 1993 after losing a three-candidate race in 1993. He was married to his wife, Claire for 73 years. “It is with sadness that I inform you of the passing of former Mayor of White Plains, Alfred Del Vecchio. Mayor Del Vecchio was our city’s longest serving mayor. He served 4 terms, from 1976 to 1993. During his tenure downtown White Plains saw significant change. Mayor Del Vecchio guided the city through the process of urban renewal, which changed the face of the central business district. Mayor Del Vecchio was a Professor of Mechanical Engineering at Manhattan College. He was elected to the Common Council in 1972 and served for one term before becoming Mayor. Mayor Del Vecchio had the honor of hosting President Gerald Ford in 1976, when the President visited White Plains for our country’s Bicentennial celebration.